Mix pineapple and dry pudding mix. Gently stir in Cool Whip. Stack cake layers on a plate, spreading pudding mixture between layers and on top of cake. 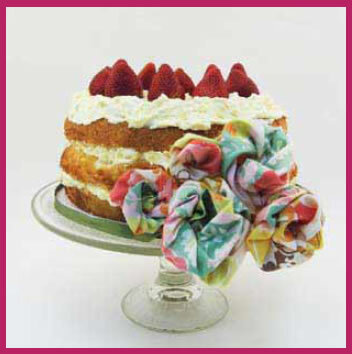 Garnish your cake with fabric Sweetheart Roses using Moda’s Swanky by Chez Moi fabric and Clover’s Sweetheart Rose Makers. Provided by Patricia Roberts, Employee of Moda / United Notions. This entry was posted in Easy, Events, Food and tagged Chez Moi, Swanky.